You can make changes to individual variation SKU. Uncheck Show Main Sku Only, Hit F5 or the Fresh button. You can then unhide and edit the variation Skus individually. 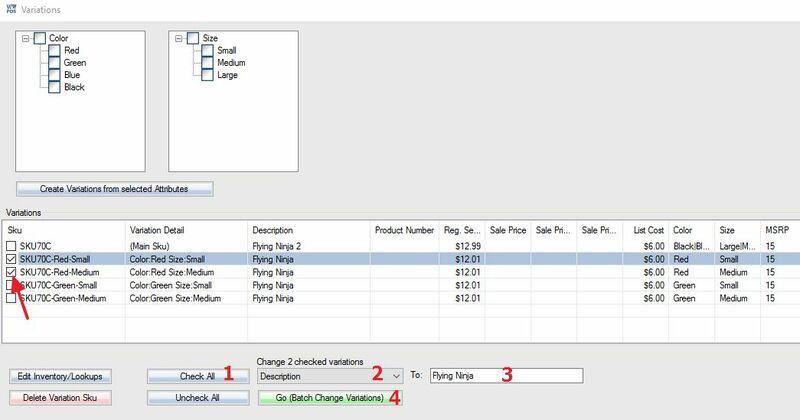 Select the main Sku, make changes like description and price, click the Save button. A variation bulk editing screen will pop up. Hold CTRL key and click the variations you want to change, or just click Select All Variations to select all. Click Apply Changes to Selected Variations. Click the Variations button in Skus Info tab. The variation window will pop up. Check the checkboxes on the left side of the variations, or check Check All. Select the field to make the change.